A testing and validation program has proven the performance of the new seal types to ensure maximum functional safety and service life. 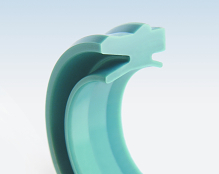 Polyurethane, with its good elastic properties and unique mechanical strength, is the ideal material for pneumatic seals. The material formulation as well as the design development is best focused on the demands of pneumatic applications to achieve optimal results. A testing and validation program by Trelleborg Sealing Solutions has proven the performance of the new seal types to ensure maximum functional safety and service life. • two cushioning seals for the adjustable pneumatic end cushioning. In order to reach the lifetime travel of at least 6,500 km (≈4,000 mls), the given minimum of grease lubrication must be maintained in the area of dynamic contact. That is realized by a flexible sealing lip geometry to achieve low radial force and a rounded contact area to let the lip float on the grease film. 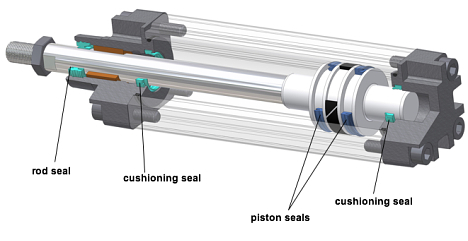 If hydraulic seals were used in pneumatic cylinders, the high radial force and the sharp sealing edge would scrap the grease away from the area of dynamic contact. The grease would conglomerate in the end positions and the poor lubrication would result in high friction, heavy wear and short lifetime travel. U-cup-type piston seals have been used in pneumatic cylinders for many years. The design of the new APDF-type has several special features: It has a thin connection between sealing lip and body to achieve low radial force. Toward the contact area, the lip becomes bigger to give stability under pressure. Notches at both lips and on the outer diameter of the backside avoid malfunctions: The notches on the side of the outer sealing lip ensure proper activation when the pressure increases. The notches at the outer diameter of the back and on the inner lip act as pressure release channels in case of any pressure trap between the two U-cups of a double-acting piston. Without such notches, a pressure trap together with friction effects can cause a tilting of the whole seal in the groove, which results in an inoperable cylinder. 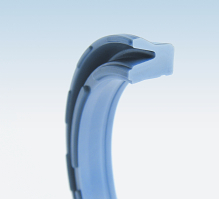 The rounded contact area of the sealing lip was optimized by FEA to ensure good function over the whole pressure range. A new Polyurethane material was developed for the specific demands of pneumatic applications. The hardness of 83 Shore A is relatively low to minimize the radial force. With its good compression set, low friction and extraordinary wear resistance, it offers all preconditions for good functional properties and long service life. The rod seal type ARAA is designed to suit grooves for pneumatic cylinders to ISO 15552. The seal has a sealing lip and a dirt wiper lip and is fixed by a retainer “nose” at the outer diameter. The seal can be easily mounted into an unsplit gland by pushing it into the bore until the retainer nose snaps into the respective groove of the housing bore. 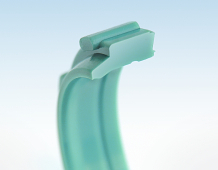 The outer, static sealing lip is chamfered for ease of installation. As the ARAA seal is fixed only by its retainer nose, the material needs to be stiff enough to withstand the resulting axial forces of pressure and friction. Therefore, a harder material grade has been chosen. The hardness of 94 Shore A ensures proper fixation of the seal as well as superior wear resistance, but must also be considered in the design of the dynamic lips: The long, thin sealing lip gives low radial force despite of the relatively hard material. The scraper lip is short and even thinner as the sealing lip. That is to avoid that the micro layer of grease remaining on the rod at the outstroke getting scraped away by the scraper lip during return stroke. Cushioning seals are used to obtain smooth piston movement into its dead end position. The cushioning seal type AICM is designed for optimized function compared to O-rings, which have also been used as cushioning seals in pneumatic cylinders. The specific design features are its dynamic sealing lip that gives good tightness and low friction, an axial sealing edge with check valve functionality and combined notches at the lip side and on the outer diameter to allow air flow. Over the main part of the stroke, the cushioning seal does not influence the function of the cylinder at all. When the piston runs towards the end position, the cushioning rod, which is the thickened end of the rod, runs into the sealing lip of the cushioning seal. With the closing of the axial sealing edge to the groove side, ensured by the friction between cushioning rod an seal, the pneumatic end cushioning can fulfill its function: The kinetic energy becomes compensated by the pressure built-up in the chamber between piston seal and cushioning seal. A throttle screw can adjust the cushioning effect. During the cushioning cycle, pressure peaks up to 2.5 MPa (363 PSI) can act on cushioning seal and piston seal. After the movement has been stopped smoothly by the pneumatic end cushioning, the pressure changes to start the stroke in the opposite direction. When O-rings are used as cushioning seals, the throttle screw slows the pressurization down. The air pressure cannot act on the full cylinder area until the cushioning rod has moved out of the O-ring. The AICM seal has an integrated check valve function that ensures the pressure acts immediately on the full cylinder area. That is realized by the design of the axial sealing edge. When pressure is acting on the backside, the axial sealing edge lifts off to allow the pressurized air passing through the notches at the outer diameter into the cylinder. Polyurethane with hardness 94 Shore A is used for AICM seals to give the suitable radial stiffness. To confirm the material and design development efforts, a test program was performed with commercially available pneumatic cylinders. All cylinders were equipped with ARAA rod seal-scraper, two APDF piston seals and two AICM cushioning seals. They underwent high pressure, bursting pressure, low temperature, temperature cycling, minimum speed and endurance tests defined to reflect harsh, but realistic operating conditions. The test results from validation prove impressively how using latest material technology and design knowledge can optimize a sealing system. The thorough consideration of all functional aspects and use of latest development tools brought an outstanding progress in performance. The material development focused on the specific demands of pneumatic applications was the second component to form a high performance Polyurethane sealing system. 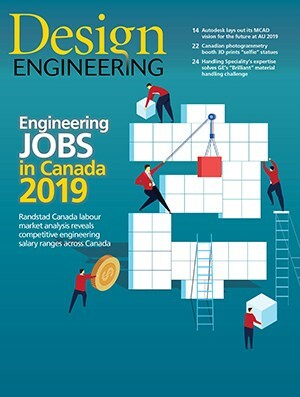 Matthias Keck is Product Development Manager with Trelleborg Sealing Solutions R&D in Europe and developed the article with colleagues Matthias Schott and Dr. Nils Kohlhase.